August Moon Farm – Breeding Warmblood horses since the late 80's. Our broodmares are a mix of Oldenburg, Dutch, Holsteiner and Hanoverian lines from successful jumping pedigrees. We select modern stallions and breed medium types as prospects for the Show Jumper classes with an occasional dressage, hunter or eventer prospect available. Most of our young horses carry papers of the Oldenburg or OS Verbands. Our horses are raised in the fields with others. Following imprinting of the foals at birth, we turn the mothers and their babies back out into the mare band. The young colts are not weaned from their moms until the spring of their yearling year. 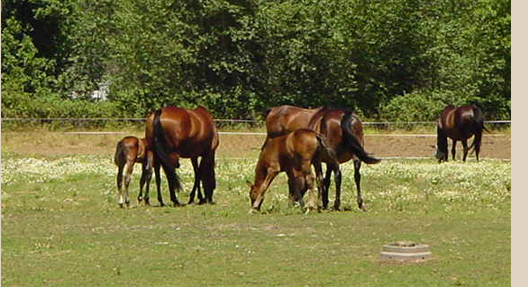 The fillies stay in the mare herd and their moms take care of the weaning of the fillies themselves. We believe that horses raised as close to the way Nature intended make the best, well-adjusted horses for human companionship later in life. We "gentle" ours in a kind and positive way. At four, we introduce them to a saddle and bridle...we never rush this part, as we believe a foundation properly laid will last the life of the horse. If you are looking for a new equine companion for use as a showjumper or hunter prospect, or simply want an older dependable warmblood with a sound mind to use for trail rides, consider the horses of August Moon Farm–pasture raised to be physically sound, and started with gentle kindness to be mentally accepting of their future with humans. Contact us and we will be happy to talk with you about our approach. Maybe we have your next horse. We won't waste your time trying to talk you into something not right for you.